I have basic finance background but I am trying to calculate idiosyncratic risk as measure for firm risk in my CEO gender research. I have found the following on Alpha architect but I am unsure of how to interpret this and actually calculate the residuals. I am not using Excel, but Stata. For this reason I really need to understand what I am doing so that I can code it in Stata. 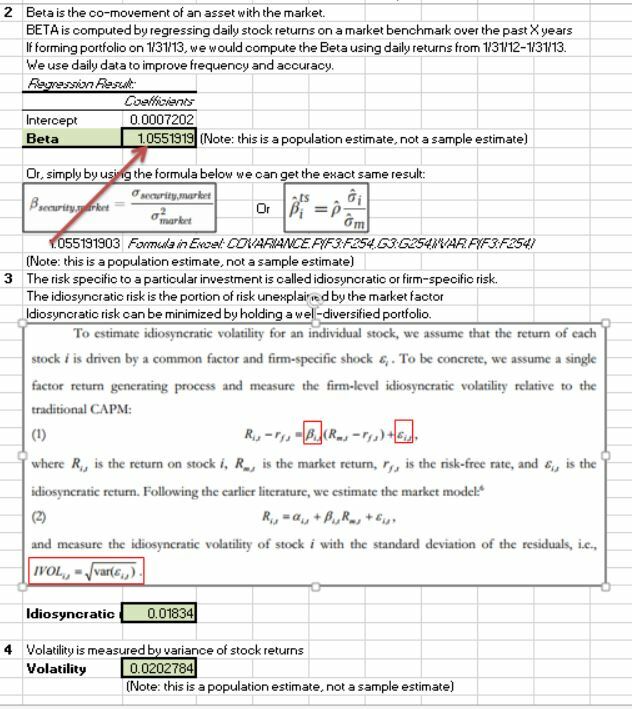 Importantly, I am trying to calculate Idiosyncratic Risk defined as follows: "the annualized standard deviation of the residuals from the regression of daily returns over the firm's fiscal year". I have some of the inputs already. I have the excess returns of the firm stocks in my dataset, the market excess returns and I have calculated the beta's for my firms. I also have the FF 3 factors. The Alpha Architect link contains an Excel example of which I am basing my questions. Here is a visualization from the Excel. Links: https://alphaarchitect.com/2014/12/19/a-quick-lesson-in-volatility-measures/ How to calculate unsystematic risk? If all firms had the same beta, the market risk would be the same for all firms, and would be the index risk. But, in the CAPM theory, some firms move (on average) more than 1:1 with the market. It is like some boats rising farther when the tide comes in, and dropping lower when it goes out. Thus, the model is that any firm has a systematic risk which is $\beta$ times the move of the market. When you subtract that out (on a daily basis) what is left is the unique, idiosyncratic risk of the firm after adjusting for the market and the beta of the firm. Not the answer you're looking for? Browse other questions tagged volatility risk fama-french standard-deviation or ask your own question.